Ribbons of buffalo grass need mowing only once a month during summer. For entertaining or playing, large outdoor spaces need careful planning. Planting a conventional turfgrass lawn is not a water-wise solution in the arid West. Nor is paving a big area always practical, since that much hardscape creates a lot of heat and glare, says Nate Downey of Santa Fe Permaculture. 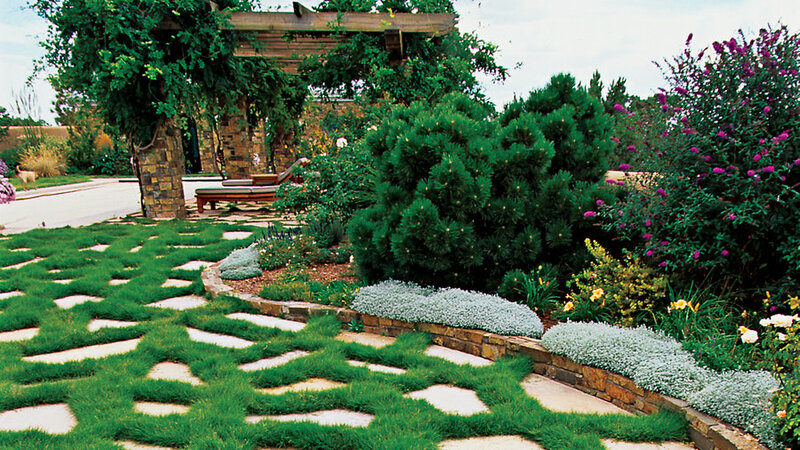 But if you lace paving stones with ribbons of native buffalo grass (Buchloe dactyloides), you’ll achieve an eye-calming “soft patio” effect, as Downey calls it, that needs much less water than a traditional bluegrass or fescue lawn. For the grass seams, Downey has found that 6 to 8 inches is the ideal spacing between the stones, which are set on sand for better permeability. June is a good month to plant buffalo grass from sod, plugs, or seed. In the project shown here, Downey used sod for quick results, but he uses plugs more often. To ensure complete coverage, he also sows in a seed mixture of buffalo grass and blue grama between the plugs. Two kinds of buffalo grass ― ‘Legacy’ and ‘UC Verde’ ― have been specifically developed for lawns in the Southwest: The latter stays green most of the year. Info: If you can’t find a local supplier for buffalo-grass plugs, order from High Country Gardens or 800/925-9387.